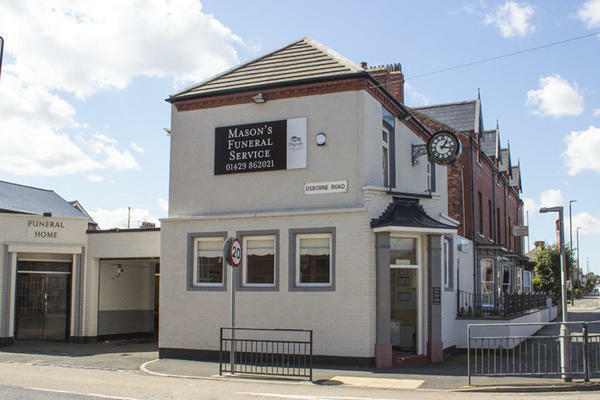 Mason's Funeral Directors in Hartlepool, County Durham, are here to help you during your time of need. We will organise a dignified, respectful funeral for your loved one, making the arrangements on your behalf. We are also specialist memorial consultants, and we offer an array of unique memorials that pay tribute to the memories and life of your loved one. Our funeral home has six chapels of rest, which you can use to spend time alone with your loved one before the funeral. The building is tastefully decorated, and designed to cater for you when making the funeral arrangements. You can get in touch with us 24 hours a day, so please give us a call as soon as you need our assistance. At Mason's Funeral Directors, we understand how special life is with those that you love. For us, every funeral is unique and personal. We have a service to fulfil every wish, with every detail carried out with the same uncompromising quality of care. From a traditional service, to a colourful woodland burial, your options are limitless with our Full Service Funeral. If you have a little more flexibility when it comes to arrangements, then we can provide a Simple Funeral for a lower cost. We are located on the junction of Park Road and Osbourne Road, opposite the jewellers. Our staff are available 24 hours a day on 01429 862021 if you require our services outside of these hours. A funeral director who understood our requirements and provided a very compassionate service. An amazing service was provided by the company, highly recommend and everything done to mine and my late dad's wishes. Cannot fault the service at all. A well deserved 5 stars. I truly believe that the service provided by Mason's Funeral Directors was second to none. Their help and professionalism really was brilliant. I thank you from the bottom of my heart because at a difficult time your assistance was very beneficial. Excellent professional, efficient and thorough, have used them before and no doubt will use them again! I was thoroughly satisfied with Mason's handling of my late fathers funeral. All of the staff were very professional in every aspect of the funeral arrangements and at the same time genuinely sympathetic and sensitive. I cannot recommend the highly enough. Everyone associated with Masons were so caring and could not have done any more to make things easier,they were brilliant. Masons provided a superb service and my mother's funeral was conducted with great respect and dignity, and almost military precision. First class service. Every detail was taken care of in an empathic manner. Thank you for taking the time to send your online review to us. I am pleased that we provided the highest level of care and guidance for you and your family and that we were able to make things a little easier for you at such a difficult time. The service my family and I received during our recent bereavement was amazing. Thankfully our Mam had a prepaid funeral plan which she had arranged herself with a member of staff from Masons. Together they had ensured that everything Mam wanted would be covered which gave her peace of mind and made things incredibly easy for us when the time came. My experience of the service we received was also fantastic. The empathy and kindness shown to us by Damon was exceptional. Nothing was too much trouble and Damon worked hard to ensure that the send off we wanted for our Mam went ahead without a hitch. He kept us informed throughout the process and added little touches which we had not thought of but which meant a lot to us afterwards. Thank you so much for all of your support, professionalism and for ensuring that our Mam got the send off she deserved. Thank you for taking the time to send your online review to us. I am pleased that we were able to look after you and your family at this difficult time and that the arrangements for your Mother were carried out to your satisfaction. Couldn’t ask for anything more they really looked after my Mother and me. Every detail that we as a family wanted to incorporate in mams funeral was done with compassion, dignity and respect. Tracy was brilliant. We appreciated her guidance through this difficult time for us. Thank you for everything Masons have done. A. Waterman and family. From first contact we received friendly , compassionate and efficient service . Every detail was meticulously followed by Tracey and her support to ourselves was greatly appreciated. Our beloved brother in law's wishes were carried out to the letter with the utmost care and dignity. Thankyou.